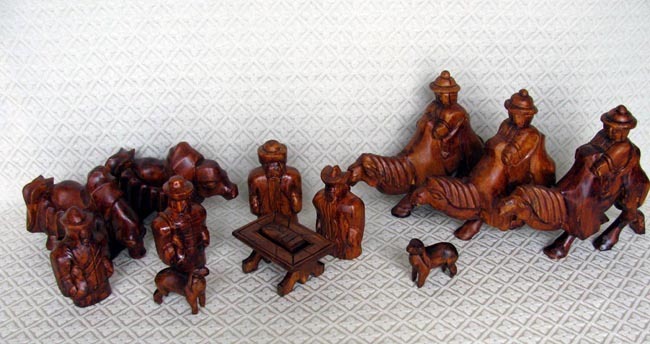 This Mongolian Nativity was carved by our friend Badrakh. The wood is pine that has been stained dark brown. The pieces include Joseph with beard wearing a hat, Mary with braided hair down her back also wearing a hat, Jesus in a cradle bed, two shepherds each carrying a sheep under his arm in a bag, two standing sheep, two yaks for the shepherds to ride, and three wise men riding camels. Most standing figures are 4 inches tall. The wise men on camels are 6.5 inches tall. Mary’s single braid is significant. Historically, Mongolian girls always had long hair and they wore one braid until they were married. After their marriage, they would wear two braids as the sign of being a married woman. Since Mary is still wearing one braid, the significance is to her virginity. Another interesting detail of this set is the wise men on camels. Badrakh carved the camels to be running, so they are standing on three legs with the fourth leg in a mid-air running position. As we sold Badrakh’s early sets with this attribute, we found that sometimes the camels would not stand up solidly, or their delicate legs would break in shipment. Using this feedback, Badrakh changed the design of his camels to have more solid legs. The other Nativity by Badrakh in our collection has the modified camel legs, so we are pleased to also have this set with the original design.